A cattle yard might seem an unlikely place to find three Belgian couples working on their relationship, but Charles Darwin University’s (CDU) Katherine Campus is helping them get closer to winning a wedding Down Under. 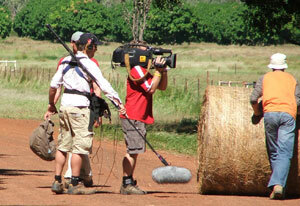 The University’s Rural Campus, 16 kilometres north of Katherine, today became the set for the Belgian reality TV show “Wit Down Under” (White Down Under). With the cameras rolling, CDU Lecturers at the Campus instructed the contestants in various challenges. One couple was asked to roll a hay bale for one kilometre, another to build on their relationship by constructing a fence and the third couple completed an intellectual challenge involving planks of wood. CDU Lecturers were then asked to judge the couples on their performance of the tasks. The Director of Rural Studies in Katherine, Dr Brian Heim said it was a wonderful opportunity to showcase the University to another country. “We’re not just a location for the TV series. There’s an educational component to the program so during the episode people will find out about rural studies at CDU,” he said. The show’s Chief Editor Bieke Pillen said it’s the second series of the popular reality program, which has been filmed at locations all around Australia. The first series was filmed wholly in the United States and was watched by one million viewers in Belgium – 10 per-cent of the population. “We love the idea that our contestants, who are mostly city people, have been able to get in touch with the students and teachers, experiencing life at the campus themselves by means of some challenges,” Bieke said. She said CDU’s Rural Campus reflected the atmosphere of the Katherine region. “It’s a very beautiful location and for a school it was perfectly integrated with nature. The series will be aired in prime time on VRT, the Belgian national television network, and on cable to an audience in Holland, from September 2006.